My dining room is stressing me out, and has been for quite a while! I'm longing for a cleaner, simpler look. Time to de-clutter and edit. When Bonnie Broten was here, she thought the same thing. We talked about removing the curtains and leaving just the bamboo shades. I thought I heard her mumble the word "dated." Gasp! So, as much as I love this brown floral fabric, I think it has to be retired. I'm not sure if it's because there is too much of it, or if it is just "over." I realize that it's weighing me down! The brown screen in the corner is also weighing me down, even though I love it still. Then there is the chandelier. Yes, it's pretty. But, I am envisioning something lighter, airier, less feminine. I decided to remove the slipcovers off the parsons chair to reveal the poor chair in her underwear and get a feel for the room without flowers. Not pretty! New linen slipcovers would be gorgeous! Down came the floral drapes. The French chairs look great on the ends of the table. Now the grandfather clock looks ridiculous where it is! Perhaps it would look better in the corner or even the living room. Speaking of the living room, it also is weighing me down. But, we won't go there! I'm still loving my wallpaper. This is definitely a lighter look, but the drapes really are better in the living room. Now, I've created a huge mess! On our way back from Asti, Bonnie and I stopped in at Restoration Hardware's flagship store where we got samples of linen drapery fabrics. We both thought this Belgian linen would be nice in the dining room. RH has just introduced this loose weave unlined burlap, which is on sale. I'll admit, I was intrigued. Perhaps it could go in the living room, freeing up the living room floral to go in the dining room. Do you see why my dining room is stressing me out? Thank you for the therapy session. I ended up putting everything back, and will probably talk about making changes for another year! After all, I'm my own worst client! When and if you change the dining room it will look like everyone else's home. I love your taste and feel the fabrics are cozy and rich. I am so tired of linen/burlap and sisal/seagrass and no one thinking individually. I find those rooms rather boring. Everyone is doing the same thing. Your chandy is beautiful with the wallpaper. :) Is that being removed too? Than goodness you are going to think this through. Find a way to at least keeep some of these individual pieces intact and let your personality shine. It's always easier to re-do someone else's rooms. You are not emotionally attached! I'll stick with you as you deliberate the changes. Although I am sure any changes you make will be wonderful, I think your home is absolutely beautiful and unique just the way it is. Your home is an inspiration. You had me cracking up by saying your chair was now just in its underwear. I never thought about that one before! I do love the fabric pattern in there, but agree a more streamlined look with the green wallpaper might be a nice change. I think a solid cream would be nice on the windows and chairs. You could still use your accessories to provide more color and texture. 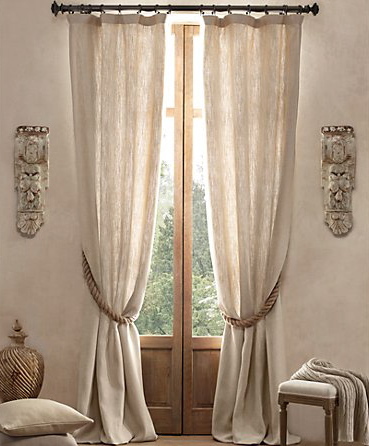 I have cream colored drapes in many of my rooms and love the versatility they give me. However, this could wait till Spring. The colder weather might feel better to be wrapped in all that luxurious brown fabric! I love your cozy and warm dining room. Always have. We tend to want to go with the latest trend. I certainly understand wanting change though. I am the queen of change. I don't think you should change it. Your dining room is one of the reasons I started reading your blog. I agree with Dianne, don't follow the trends and look like everyone else. Your home is gorgeous and individual. Who cares if something is "dated"? How can classic looks get dated anyway? I struggle with the same ideas, but I always go back to he cozy looks of my home. I am facing the same dilemia and it sure isn't easy, one room seems to draw on another. This is all very beautiful...but if you want to change things, maybe changing the wallpaper would take care of it all. Have you thought of that? Darlene isn't amazing how one thing leads to another and another!! I would love a lighter fresher look, however be you, even if it is a lighter floral. I love linen, it is so lovely; I just know how unique you are! I'm chiming in that I like the brown drapes. It has a great feel moving into fall. You can always get a second set of light drapes for the spring. You can send me the old chandelier for my bedroom...! I agree completely with the first commenter!!! I love your style, its so cozy, warm and inviting. I absolutely love your drapes too. I do think your french chairs look great at the ends of your table! Do whatever makes you happy!!! I have to agree with others who say keep that gorgeous brown floral fabric on your chairs and drapes. It is so rich, warm and inviting. To me it says: Come in, sit down and be ready for a great meal. At most I would wait until Spring to bring in linen drapes and slips and then go back to the floral when Fall comes again. And maybe by then the RH look will be out anyway. I also agree you have a stunning style of your own that brings us here to see what you are doing next. 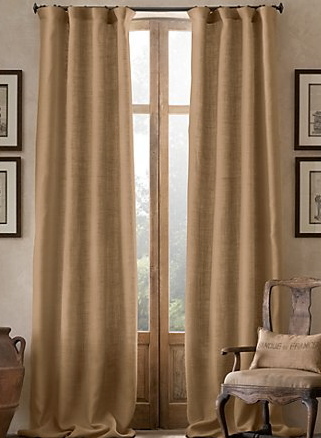 It is that warm, cozy, rich and textured look that makes your rooms you. I am in absolute agreement with your first commenter. I love your room just the way it is. It's so warm,and cozy.All the beautiful colors,and texture.The chandelier is gorgeous.You put your heart in your home,and it shows.Everything you did has your elegant stamp on it. I got some great ideas for lightening up! Send me that screen and I'll Sweidish it up! you won't even recognize it! It could also be disassembled and made the two end pieces made in to shutters. one large creamy bowl or sliver dome cloche ... less piece-y ... and yes, the rattan shades can carry the windows alone. and btw, Kathysue is spot on! What? No... No... Don't give into the neutral trends. I already had this talk with Artie...I did it and regreted it. Now I am stuck for a while. It looks great... but not my style...just cookie cutter blog land style. Your dining room is fabulous and put the screen back... it's timeless. Slap... Slap... Pull yourself together dear...you've been blogmotized. I couldn't help but comment... I love your blog... because it does give me an option for new and colorful inspiration... so tired of the blah blah blah... timeless speaks to me. Weighed down? I see "Welcome and sit down put some color in your life"
PS. In some instances the definition of the term 'dated' means... The person speaking wants to put the color green in their pocket.... at your expense. However... This has a great benefit for those that don't go for trends but timeless interiors... Great flea market and thrift store castoffs! 'Ralph Lauren' feel... it doesn't get better than that. Okay...now I've said my peace. 1. your room is beautiful as is... it's speaks of your special talent for design. 2. You want change - do it gradually. Changing one thing can make a big impact. 3. It's always easier to give advice than to make decisions. 4. Decluttering is a good thing. I am still working on that myself.. I love your home. I think all creative people go through a process of board-om! I have gone through the same thing. I like what you have done. Just adding the new chairs and taking down the curtains looks great. I think you should keep the chandelier for now. It is unique. I think it will lighten up with all your new changes. Go for it. I love this room. Don't dress it down to the plain linen look...That's okay in some cases, but this room is classic and deserves a level of elegance. If you do change up, keep it elegant! I'm actually surprised you have the wooden shades in there. Your clock is gorgeous and I love how you brought the curtain rods right up to the top of it. I guess I'm out of date but I could see some cream colored silk dupioni drapes in there. HI Delores! Oh, poor darling - you're in distress! Well, let me tell you something - your home is gorgeous and it's you! Decorators have their place but your home is you and I love all of your beautiful draperies and your style! Just let your home be you! It's so elegant. I guess you can tell I'm a big fan of your decorating style! I love your style but understand getting tired of fabrics or certain looks. If it were my dining room (and it's not) I would keep the rich, brown floral drapes and change the wallpaper to a neutral, painted back drop. I've been in the same boat and it's not easy, but I love it once I've forged ahead! Your readers will enjoy the journey with you. All the commenters make good points. A decorator is always her own worst client, and I think you are wise to think about it some more. The rooms are beautiful, and you have obviously made a significant investment in them. I am getting really tired of the ubiquitous linen/burlap/seagrass look -- because although it makes for some fetching eye candy in photos, I know that it would bore me to tears. I would be adding color and interesting things in no time, and I think you would, too, by looking at what you have done heretofore. I understand your quandary & I can sooo relate. We need new living room chairs & I'm stuck. Your personal style is so interesting & I love seeing what you've come up with. I say sleep on it awhile & like Marlis advised, do a little at a time & perhaps Spring would be a better time to lighten up, since your rooms look just PERFECT to me for the upcoming Thanksgiving & Christmas holidays. I'm sure whichever way you go, it will look great. I'll be watching. As always your home is beautiful, but I think you should change it up if it's dragging you down. I recently had the same problem in my master bedroom. I just was not in love with it and it completely depressed me, so I took the plunge and painted, got some new linens and accessories and now I am completely loving it. I am really feeling so much better now, seriously. I think you would find that if you did go ahead and change some things you would feel better too. Ohhhh my goodness! I LOVE your dining room!! LOVE LOVE it! And that fabric is one of my favorites!! I know whatever you do....I will LOVE....but I really do ADORE that floral fabric~! It's me again....what if you just added a white or antique white piece in place of maybe the clock to lighten it up? by the way my house used to be all shabby chic and all light colors and I changed to your colors...we all have the same problems, we love change lol! your rooms do have a "Ralph" feel to them which I adore. I also adore the Rh movement which is actually Swedish-Belgian in feel. I completely agree that this is not the time to lighten up your home it is perfect for the upcoming season. choice of drapery fabric was unexpected and gorgeous! If you had no doubts about making changes then it would be the right time. Just my two cents. Hi, Delores. I love your dining room. I believe the brown floral on the chairs and curtains are a Ralph Lauren fabric. You don't see Ralph changing to a neutral linen Belgian look, do you??? While I like the Belgian trend and some of the Restoration Hardware merchandise in small doses, it may look dated in the next nano-second. Your house reflects your taste and the things you love -- confit pots, butter platters, vignettes, for heaven's sake. Live with what you love. I love your room too. It's so warm. To be honest I've gotten bored with the burlap and grey. It's the same thing over and over again. Your room looks like a lovely room to have nice music, good food, candles and just feel safe and cozy. It doesn't get much better than that. I like so many of the other bloggers love your room, I do not think it looks dated, I think it looks traditional and classic. One of the many reasons I love coming to your blog, your ideas and decor are tasteful, unique and traditional. They look like rooms that have evolved over years and was not purchased from a catalog lock stock and barrel. Your rooms do not look like the cookie cutter looks that can be seen everywhere in blogland. I heard a great quote recently from one of Canada's most loved Interior Designers, Ray Staples, now well into her 90's. Addressing interior design students at an ARIDO meeting she said "where's the f'ing magic. Please Delores Read this post here by Margo Austin for more on Ray. Seriously Delores, when I looked at that RH catalog...that's exactly what I thought. Your dining room is gorgeous. It works with all your lovely place settings. You can't switch to white plates and napkins now...we love your style. Your rooms are stunning. They resonate the Charlotte Moss style of decorating. They are rich, warm, and inviting. I, for one, could sit in your dining room for hours. What a lovely talent you have! I'm with everyone else who replied to your question(s). Keep what you have for now. You'll appreciate the feeling of comfort your decorating provides during the nippy months of the year. If you would like to 'lighten up' for Spring and Summer, I'd consider a lighter colored drapery panel and even think about a whimsical border to bring in extra color and tie it to the rest of the room. Have you ever considered looking at the Thibaut, Kravet, or Duralee Print fabric books? There are some wonderful prints that have depth (and even humor)? Many of those fabrics have gorgeous prints on paler backgrounds that would work beautifully with your wall paper. Please take a look at Charlotte Moss' "Winter House" book. I think you'll find great inspiration there. Also consider William Yeoward "At Home". His dining room has the same richness as yours. He used unexpected colors and patterns to add a sense of lightness. Both books are easily found at Barnes and Noble Booksellers. RH is definitely NOT you. Your style is evolved and personal. It is unique and it tells us a story about YOU. RH is off the shelf and a great place to begin for someone who is just starting to decorate (neutral backdrop). Your home is beautiful. It is an inspiration! I'm late to the convo, but I am one who loves mixing color and pattern. Lay it on! For whatever it's worth, if this were my dining room, I'd keep the florals. I think the fabric is rich, but still very cozy and inviting. Your look is timeless. Although I like the burlap and seagrass I think it's already peaked with it's popularity. I think too many people use it to the overkill point and then it just winds up being an overall boring, drab and unoriginal look. I bought that fabric last year and am waiting to use it in my bedroom in my Palm Springs house...then I saw a glimpse of yours and asked if it was Waverly but I never heard back from you...now I can see the whole pattern and it is absolutely the one I have and I so love it in your home and can't wait to get it in mine...I have also thought about going all linen, neutral etc but that's not me, I love color and warm earthy tones and just swoon everytime I see your homes, you have such lovely taste and that is why I don't miss a post , and now after seeing so much of this pattern I know I lOVE it! If you decide to get rid of your brown floral draperies, please let me know! I have been coveting that sort of pattern for years. I do have one condo bedroom in a similar print by Weathervane Hill. Remove the screen, center the clock between the french door outside trim and the wall where the screen was. Oh, I'm so happy you have decided to keep your room the way it is for Fall and Winter. and maybe longer... it is so beautiful, I don't think I'd ever want to change it. I hate to think that you cannot have your own "look" without someone saying it is dated. To me, lovely is just that... lovely..and your home is lovely and more. I would only change, if I was tired of it all, or fell in love with a different style. I love your room the way it is. It is so personal. Those trendy rooms are nice to look at, but I think they would be hard to live with. :) Maybe, you should just play with what you already have and repurpose some of your things? What about a beautiful mirror to bring light into the room? Maybe, one area in the dining room that your eye can rest on, peacefully?? What if you got rid of the roman blinds, moved your clock away from the windows and chose drapes that are green. Choose a beautiful, elegant, lighter fabric (maybe a fresh green silk) that will accentuate the view from the windows and blend with the wallpaper. That way you are looking at the view, instead of the clock and curtains. If you need some privacy I would be tempted to install beautiful white sheers, as well. I think it would make you room feel lighter without changing everything... what do you think? :) I would be also tempted to change the items on the table if you want something lighter. Maybe some mercury glass pieces, silver, and glass for sparkle? :)BTW I LOVE your wood screen. I love your rooms and hope you did't change a thing! Why do we always feel that we have to look like everyone else? Your rooms are inviting and warm and lovely.